A firecracker (also known as a 'noisemaker' or 'banger') is a small explosive device primarily designed to produce a large amount of noise, especially in the form of a loud bang or report; any visual effect is incidental to this goal. The device consist essentially of a cardboard tube, a fast-burning composition, end plugs and a fuse. When the composition is lit, the gases create a pressure causing the tube to explode thus creating a sound. Firecrackers most commonly use the composition known as flash powder, which can be a mixture of potassium perchlorate and aluminum powder in a ratio (by weight ONLY) of 70% potassium perchlorate to 30% of high pyro quality aluminum powder. No matter what the name of today's commercially produced firecracker (for example: M-100s, M-1000s...etc) ever since 1966, the maximum amount of explosive composition has been set at a 50mg limit. Before legislation passed in 1966, certain firecrackers used to contain several grams (there are 1,000mg per gram) of flash powder. 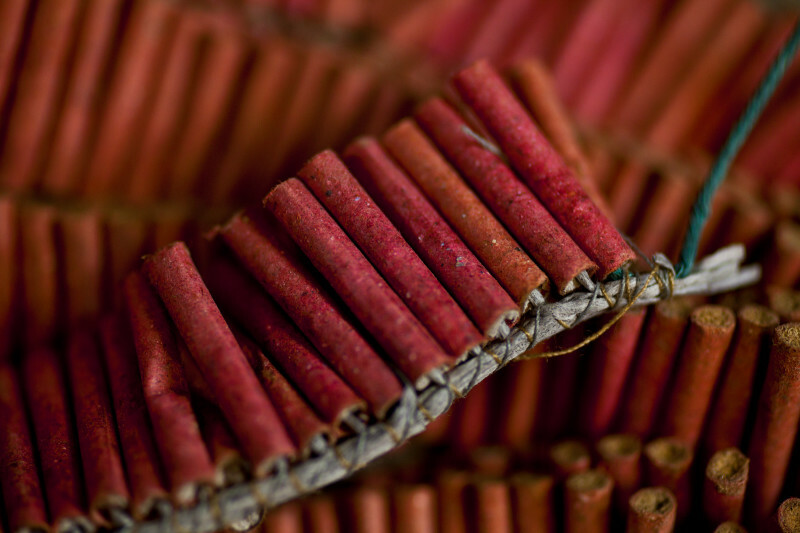 There are many different ways of constructing various sizes of firecrackers and also many variants in the explosive compositions used.